If you find a mouse that resembles one in the picture, better mind your language. Endoacustica has released a PC mouse that starts spying on you as soon as you turn on your PC. 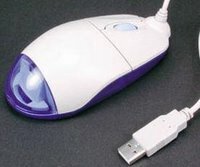 Once you switch off the PC, mouse stops working. This spy USB mouse has a built-in sensitive microphone. When connected to the PC, the mouse starts transmitting your voice signals to a nearby receiver.